E.T. The Extra-Terrestrial, AcademyAward®-winning director Steven Spielberg’s magical adventure, celebrates its 30th Anniversary with its first-ever release on Blu-ray™. Featuring an all-new, digitally remastered picture that delivers six times the resolution of DVD, as well as all-new 7.1 surround sound, the E.T. The Extra-Terrestrial Anniversary Edition Blu-ray™ Combo Pack includes the 1982 theatrical movie, an all-new interview with director Steven Spielberg, and “The E.T. Journals” featuring never-before-seen footage from the set of the film. The Blu-ray™ Combo Pack also includes UltraViolet™, a DVD and a Digital Copy of the film, offering fans a chance to relive the mystery, laughter and wonder of the iconic movie anytime, anywhere on the platform of their choice. 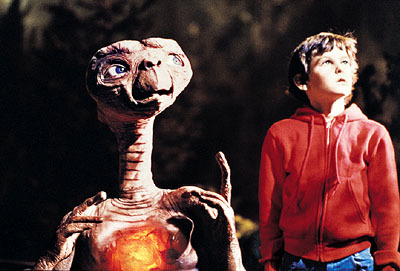 In 1982, E.T. The Extra-Terrestrial became the biggest blockbuster of the year, ranking #1 over 16 different weekends. Even today, E.T. The Extra-Terrestrial remains the fourth most successful movie of all-time in he United States. I have incredibly fond childhood memories of this film, it was one of a choice few movies that I could watch over and over again! It was so much fun to share one of my favorite childhood films with my children recently for family movie night, and the bonus features are absolutely fabulous! Every E.T. fan [old and new] will enjoy the never before seen footage and the behind the scenes look at the making of E.T.. It was also incredibly interesting to get a peek into the mind of renowned director Steven Spielberg and to hear his thoughts on this timeless family classic. “When E.T. The Extra-Terrestrial premiered in 1982, it captured the imaginations of people young, old and everyone in between in a way that was unparalleled in modern movie history,” said Craig Kornblau, President of Universal Studios Home Entertainment. “A global cultural phenomenon—and the biggest box-office blockbuster of its day—E.T. brought out the child in all of us. We are thrilled audiences will now be able to experience the film in the astounding quality of Blu-ray." Film SynopsisWhen an imaginative boy meets a lost alien, it is the beginning of one of cinema’s most endearing friendships, as Elliot (Henry Thomas) helps the marvelous creature he calls E.T. find his way back home before government agents can capture him. Click below to print out your free E.T. Anniversary Edition coloring pages and fun activity sheets. Out of this world fun for the entire family! E.T The Extra-Terrestrial Anniversary Edition on Blu-ray would make the perfect pick for your next family movie night! E.T. The Extra-Terrestrial Anniversary Edition Blu-Ray Combo pack can be found at retailers nationwide.